Welcome to Cedar Ridge Lodge. This Epic Log Home is one of the largest log “cabins” in Canada. This architecturally designed and custom built masterpiece is filled with Great Eastern White Pine logs, each rounded to fit into the next. Simply Stunning. This 25 room luxury property is an easy one and a half hours north of Toronto from the 400/401/ airport on the beautiful waters Georgian Bay. 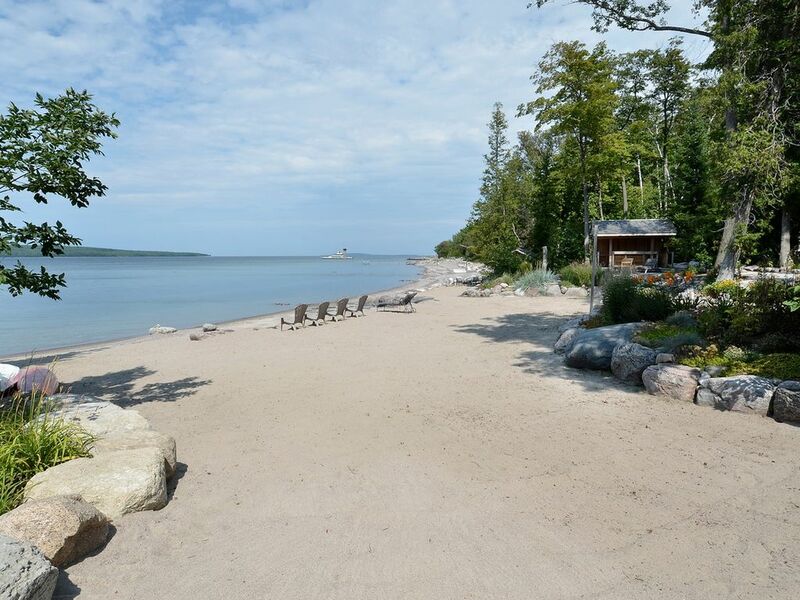 The 18,500 square foot cottage offers all of life’s little luxurious, spacious living and activities for everyone. . Over 400 Feet of superb beachfront, with a total of 650ft of waterfront for your enjoyment. Child friendly sandy beach an outdoor bar and two cabanna’s await you. The vacation lodge was designed and built for year round enjoyment. Your family will enjoy a luxurious holiday estate: bright, spacious, comfortable, with ample room for family and friends. Six bedrooms, seven bathrooms, a main-floor family room, a home theatre room, and a lower level accommodation for guests, this carefully designed estate vacation home is all about comfort in a beautiful cottage setting. The Professional kitchen has a Sub Zero fridge, dishwasher, warming ovens, convection ovens and a Thermador Grill. Over 2,000 square feet of decking on two levels provide beautiful views of the lake. Extensive glass provides panoramic views of the lake and of golden sunsets. A massive floor to ceiling wood-burning fireplace in the 25ft ceiling 'great room' give a relaxed feel to the property, The basement is an entertainer’s delight, 20 seat Irish bar, (complete with ice maker, wine fridge,), games area, including 10ft Billiard Table, Foose ball, Hockey Table, Dartboard, Arcade Game, Plasma TV all are right next to the bar. You will find an additional bedrooms, a 4 piece bathroom, a large living area, wood burning fireplace, (with wood service elevator) laundry facilities and a Home Theatre Home with seating for 8 ( DVD library waiting for you.) This lower level also has lots of glass along the front and 5 separate walkouts to the beach. The master bedroom wing is over 1500 sq/ft. with a Jacuzzi tub, private balcony, separate fireplace and attached staircase gym. The ultimate in privacy. Three bedrooms on the 2nd floor each have ensuites and one has a private balcony. Enjoy the four seasons in all of their splendor. Spring and summer mean swimming, canoeing, kayaking, pedal boat, fishing, diving or snorkeling wrecks, or just relaxing by the shoreline. Autumn brings Indian Summer, harvest moons. and North America's most spectacular fall colours. Winter offers snowshoeing and easy access to thousands of kilometers of groomed snowmobile trails. Downhill and cross country ski resorts are located nearby. (Horseshoe Valley and Collingwood). This property offers something for everyone. Please note that the minimum rental period for this property is 1 week. Contact the owner to schedule your magical family holiday in Georgian Bay, or the most Epic Company Retreat/conference location you can imagine. This prime property is now available for monthly as well as seasonal rentals for the spring, fall and winter seasons. All bookings require a phone call with the number listed or Skype: kathymcleod1 before confirmed. Please leave no dirty dishes, take garbage to the road. Please turn on the dishwasher..
Any food or drink left behind will be shared with staff. Key Words: Log Home, Private, BeachFront, Lodge, Corporate Retreat, Sandy, Luxury, Executive, luxury, Penetanguishene, Midland, Retreat, Christian Island, Cedar Point, Thunder Beach, Balm Beach, cottage, Muskoka region, Georgian Bay. Master Bedroom has an ensuite with full jacuzzi tub, shower and walk in closet. Upstairs bedrooms have separate toilets and sinks in each room, with sinks and shower in a separate room as well. Additional Bedrooms downstairs have full ensuite Lower level has two toilets (for him and her) and full shower. Levels of Butler Service provided upon request ($) Daily Maid Service ($) Private Chef ($) Wakeboard Instruction ($) We provide an onsite manager to answer questions and assist with your stay. Made our wedding week even more memorable! My husband and I booked this house a few months ago to have our family and friends stay and share our special day with us. The owner, Kathy, was very easy to deal with and the house was everything we could have wished for and more. The private beach area was amazing for volleyball, our wedding ceremony, hosting guests at the little outdoor cabana bar and taking out the paddle boards kayaks, etc that they supply. The daughter Kortney was our butler and she was great at making drinks, hosting, and tidying up. Was an amazing home, an amazing property and an amazing week! Cedar Ridge Lodge is located on Georgian Bay. The Georgian Bay water is crystal clear. Cottage is close to Penetanguishene, Midland, Muskoka Region. Beautiful sand beaches, boating and snorkeling wrecks. Family cottage available for rent, prices quoted are for 12 people. Lodge can sleep up to 6-22 in beds. $700 per person/week above 12 people $2,000 cash upfront security deposit required. $700 non refundable cleaning charge will be added to $2,000 security deposit. 50% Deposit taken at time of booking. Function Fee will apply to any functions. Please note: Guests are not inter-changeble during your stay. Only people listed in the contract will be enjoying The Lodge during your stay. Cancelation Policy outlined in contract.